Deadly, unorganized Palestinian terrorism and violent disturbances fueled by ongoing incitement have surged across Israel and the Palestinian territories in recent weeks. Israel's security forces are in the midst of an extensive effort to contain the wave before it deteriorates into a full-blown "intifada." Jerusalem is the epicenter of the latest wave of violence, particularly the Temple Mount, which has been used in incessant propaganda campaigns by Hamas in Gaza, as well as the Palestinian Authority in Ramallah. Both of these ruling Palestinian entities have sought to convince Palestinians that Israel is seeking to "violate" the Al-Aqsa Mosque and that this site is under threat. 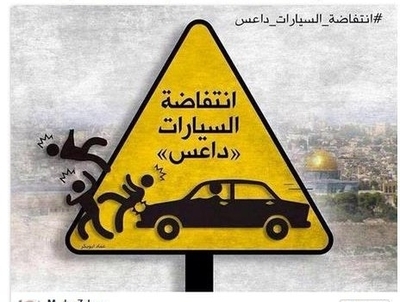 Earlier this month, Fatah's official Facebook page featured cartoons and messages encouraging Palestinians to run over Israelis with their vehicles because the Al-Aqsa mosque is under threat: "Run over, friend, run over the foreign settler!" one post read. "The Jews are defiling Al-Aqsa - will you not rage??" said another. In a recent televised speech from Ramallah, PA President Mahmoud Abbas declared that "that Muslim and Christian worlds will never accept the Israeli claim that Jerusalem belongs to it. Jerusalem will only be the capital of Palestine." The Palestinian Internet forum "Quds News Network" featured a song on its Facebook page viewed by hundreds of thousands, which said: "For you, glorious Al-Aqsa we'll run over settlers. Lay an ambush on the road. And run them over, Allah will aid you. Run them over, burn the next in line. Don't leave a single settler .Wait for them at the intersection. Let the settler drown in red blood .Terrorize them. Run [them] over, destroy, annihilate, blow them up. Don't let the Zionist live long. O Al-Aqsa, we're your defenders. O son of Jerusalem, cry 'Allah is great'!" Hamas leaders in Gaza have been calling for an intifada for years. "We shall liberate our Al-Aqsa Mosque, and our cities and villages, as a prelude to the establishment of the future Islamic Caliphate," former Hamas interior minister Fathi Hammad declared in November 2013. Hamas issues such calls on a regular basis. Fatah and Hamas use similar rhetoric, but differ in actions. While Hamas seeks to ride the wave of violence to gain support in the West Bank in order to set up terrorist cells to carry out mass casualty attacks, the Fatah-run Palestinian Authority quietly tries to quell disturbances in the West Bank, in line with a two-faced policy pursued by PA President Mahmoud Abbas. All of the attackers thus far have acted alone, according to Israeli intelligence assessments, without the cover and assistance of terror organizations. They have been driven by the incitement to violence, religious fanaticism, and years of indoctrination that pervades the Palestinian mass media and educational system. Israel's defense establishment is trying to break the domino effect triggered by each new attack. Although the claim an Israeli conspiracy against the Al-Aqsa Mosque is patently false, it formed a staple of Palestinian incitement to violence since the days of the father of Palestinian nationalism, Hajj Amin Al-Husseini. He stoked riots in the 1920s with similar incitement. Using Al-Aqsa as a symbol of Palestinian jihad was also the rallying cry for the suicide bombers that terrorized Israeli cities and murdered hundreds of civilians between 2000-05, in a campaign of terrorism called "the Al-Aqsa Intifada." Oct. 22: An east Jerusalem resident rammed his vehicle into a light railway station in the Israeli capital. A baby girl and an Ecuadorian woman died in the attack, and seven more were wounded. The perpetrator was a 21-year-old Palestinian from the neighborhood of Silwan, whose Facebook page contained pro-Hamas content. He was shot and killed by a police officer on the scene. In the hours following the attack, Fatah Central Committee member Sultan Abu-Aynayn, who is also an Abbas adviser, described the terrorist as a "heroic martyr." Fatah's official Facebook page stated: "The Silwan branch of Fatah honors the heroic martyr Abdel Rahman al-Shaloudi, who executed the Jerusalem operation which led to the running over of settlers in the occupied city of Jerusalem." Hamas competed with Fatah in praising the attack, with Gaza-based spokesperson Mushir al-Masri praising the running over of civilians as a "daring operation" to protect Al-Aqsa. Palestinian Islamic Jihad, also based in Gaza, said the attack is a "natural response to Zionist aggression." Nov. 5: Two Israelis were murdered when a Palestinian resident of east Jerusalem rammed into passengers standing near a light railway station. The attack killed an Israeli-Druze Border policeman, who left behind a pregnant wife and young son, and wounded 14 others. An Israeli, teenager died of wounds sustained in the attack days afterwards. Police shot and killed the terrorist after he emerged from his van with a metal pole and assaulted bystanders. Security forces described him as a Hamas-affiliated resident of Shuafat, Jerusalem, whose brother, a convicted terrorist released in the Gilad Schalit prisoner exchange, now in resides in Hamas' overseas headquarters in Turkey. Nov. 10: A Palestinian from Asakar, near Nablus in the West Bank, entered Israel illegally and stabbed a 20-year-old Israeli soldier to death at a Tel Aviv train station. Police arrested the terrorist after he was attacked by passers-by. Nov. 10: An Islamic Jihad-affiliated Palestinian from Hebron tried to ram Israelis with his car at a bus stop near an Israeli settlement. He then stabbed three Israelis, murdering a 25-year-old woman. The attacker was shot and injured by a security guard. He previously served a five-year prison sentence for firebombing an IDF patrol. Nov. 11: In violent disturbances in the West Bank, Israel Defense Forces soldiers shot dead a Palestinian who pointed an improvised weapon at them, and two Palestinians involved in firebombing a road sustained gunfire wounds to their legs. More Israelis have been murdered and injured by terrorists in the past month than in the past year. To try to curb the violence, the Israel Defense Forces deployed several support battalions in the West Bank, and police have significantly increased their presence in Jerusalem. Security forces have fortified public transportation hubs, and placed barricades around bus stops in the West Bank. At the same time, security forces stepped up arrests of suspected rioters, and continued to monitor and disrupt daily attempts by Hamas and Palestinian Islamic Jihad to form organized terrorist cells in the West Bank. At a recent security conference in Tel Aviv Tuesday, former Mossad chief Danny Yatom warned that Palestinian terrorist organizations are today "trying to carry out a mega terror attack. Their aim is to create a number of simultaneous incidents at multiple locations. Just because this hasn't succeeded until now is not a guarantee that they won't be able to do it again, similar to the World Trade Center attack. The end goal of the terror organizations is not just to strike, but to destroy nations and expand Islamic borders." Defense Minister Moshe Ya'alon said this week that there "is no question" of a link between all of the recent attacks, which begin on the Temple Mount. Ya'alon has also asked religious nationalist Israeli politicians to stop visiting the Temple Mount, as such visits play into the hands to radical Islamists and enable them to promote further anti-Israel conspiracy theories, which in turn fuel more violence. Additionally, Netanyahu pledged this week to outlaw a group of male and female Islamist activists who converge on the Temple Mount and attack Jews who visit the site. The activists are organized by the Islamic Movement in Israel, whose northern branch, maintains ties with Hamas and coordinates activities with it in Jerusalem, according to the Israel Security Agency [Shin Bet]. It is an outrage that Jews cannot go to pray at the Temple Mount. It is an act of cowardice by Israel's Defense Minister Ya'alon and the government of Israel. This site is no less sacred to Jews as it is to Muslims. Once again, Israel cowers to pressure from Obama. as well as Jordan.